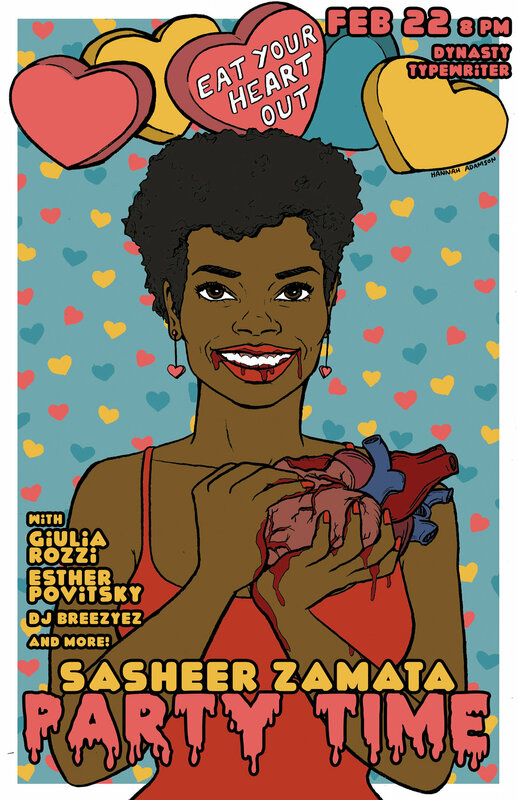 Sasheer Zamata Party Time w/ Giulia Rozzi, Esther Povitsky, DJ Breezyez + MORE! Sasheer Zamata Party Time is a variety showcase hosted by Sasheer Zamata (SNL, This American Life) where she invites comics and musicians to perform and play party games with the audience. We're all here to party, and you're invited too! Sasheer Zamata is a comedian, actress, and writer based in NYC. She was a cast member on Saturday Night Live for four seasons and has appeared on This American Life, Transparent, People of Earth, Bojack Horseman, At Home with Amy Sedaris and Inside Amy Schumer. She's in the films I Feel Pretty, The Outdoorsman, Yoga Hosers, Sleight, and Deidra & Laney Rob a Train. She serves as ACLU's Celebrity Ambassador for Women's Rights, and you can watch her standup special Pizza Mind on Amazon and listen to it on iTunes and Spotify.